Students share their experiences, talk about the projects they have worked on and what it is like to study conservation at West Dean College. Read conservation case studies. 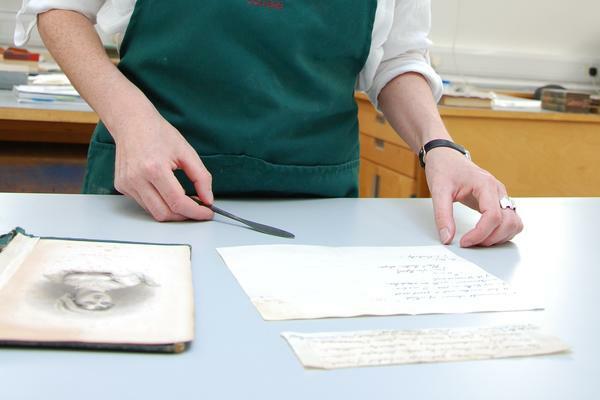 In 2014 the Book Conservation Department was commissioned to work on a rare piece of text handwritten by Jane Austen. The text was part of a sermon by her brother, which Jane had copied out. The scrap of text was pasted to a letter written by her nephew, which was pasted into a First Edition of The Memoirs of Jane Austen (1870). The aim was to stabilize the text for exhibition at Jane Austen's House Museum, Chawton, and to enable the handwriting concealed between the pasted sheets to be viewed. 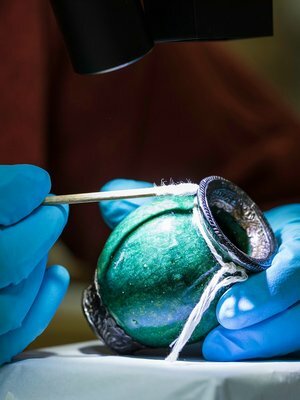 A team of four students were involved in the project, from initial analysis to testing and conservation. Initially a full condition and treatment report, documenting the condition of the book and identifying issues was prepared. "The condition report was very detailed and included, for example, identifying patterns of damage throughout the book, looking at the sewing (which was broken) to identify original patterns of sewing, and testing samples of the iron gall ink in the letter." Kiera Mckee, Graduate diploma. After testing and analysing the results, humidity packs were successfully used to separate the sheets, revealing Jane Austen's handwritten text for the first time in over 120 years. The students then undertook work to stabilise the inks after their exposure to moisture and house the book and fragment for safe storage and exhibition. The team were also tasked with repairing the book, including reattaching the cover and text block, which had separated. Also involved were Snow Fain who mounted the fragment of text in a custom-designed enclosure, and Tiffany Eng who produced a book box to contain all associated parts of the item plus relevant documentation (both books Graduate students). The project generated international news coverage, from the New York Times to local our local BBC News, as well as much interest from academic colleagues from the conservation and literary community. One of the key projects in the Furniture Department was the conservation of an 18th century Italian carved gilt pier table belonging to The Wallace Collection in London. 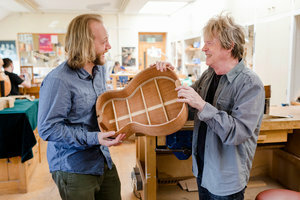 As one of a pair, the project provided an exciting opportunity to collaborate with The City and Guilds of London Art School, with one table undergoing treatment there while its counterpart arrived at West Dean which Kate Aughey who graduated last year worked on. 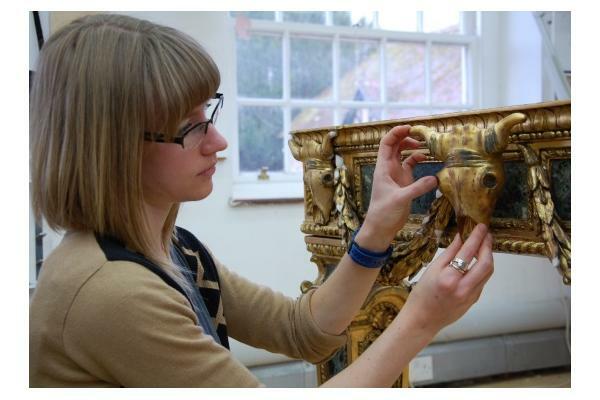 As a student conservator Kate replaced losses to the decorative carving and gilding. A new ox-head, or bucranium, was carved and gilded to replace one missing from the decorative frieze. Luckily, the central bucranium on the proper left side was intact and could be used as a reference. Once the table had been reinstated in the Great Gallery, Kate spent time with Head Furniture Conservator, Jurgen Huber, completing the surface finishes. "It's been a privilege working on such an important object from one of the country's top furniture collections, whilst still a student at West Dean," says Kate. 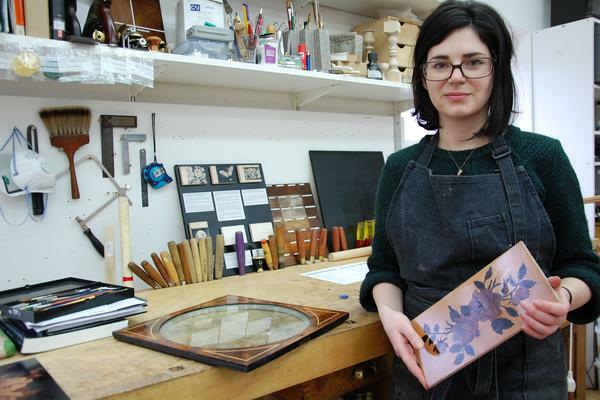 "I'll now be able to take the skills and experience I have gained into my career as a qualified conservator." 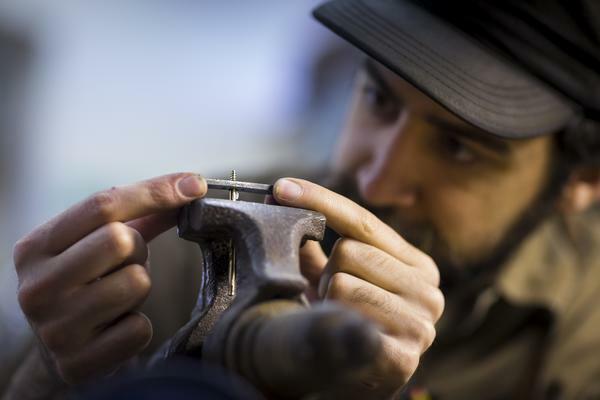 "Prior to attending West Dean, I completed a BS degree in Manufacturing Engineering. Previously, I worked professionally as a toolmaker and machinist in the perforating and aerospace industries. I feel that studying conservation will lead to a career where I can combine my background in science and technology with my interests in hand crafts, art and history. This summer I'll be working as a conservation specialist focusing on operational artefacts for the Henry Ford Museum in Dearborn, Michigan." 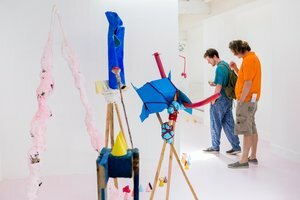 "I know for certain that without the diploma from West Dean College, I would have struggled to get the work I now have, and I have been told by my new employer that the reputation of the college was a significant factor in his decision to take me on." "I have had the opportunity to work on some truly impressive and important objects requiring varying degrees of treatment. 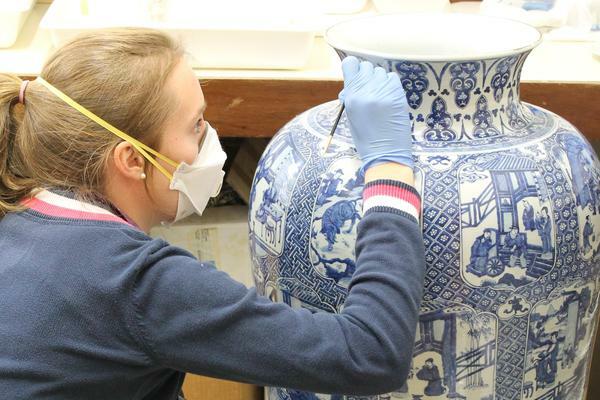 One completed project was the conservation of a Chinese Export Hard-Paste Porcelain Blue and White 'Soldier' Vase and Lid, from the Kangxi Period (1662-1722) from the factories possibly in Jingdezhen in China. A comprehensive programme of work included the removal and dismantling of previous restoration, cleaning, bonding and filling areas to replace lost material and retouching missing decoration. Thorough examination and research was undertaken, supported by documentary photographs, to assess the condition and to observe the extent of the previous repairs. It has been an immense pleasure to work on such a challenging, historically important and decorative piece." "I recently decided to return to my roots in heritage. The West Dean Diploma in Conservation - Restoration of Clocks is a key step in that journey. The decision to come here was a carefully researched one. Its reputation is first class, the focus on applied bench skills complemented rather than repeated previous training. The experience has exceeded expectations. The facilities are excellent, the tutors awesome, the scope limitless." "After completing my degree in History of Art and French I worked in politics before studying Furniture Restoration at London Metropolitan University. I became interested in conservation and familiar with painting restoration and upholstery during my degree but wasn't sure which area I wanted to go into. I decided to come to West Dean as I wanted to do an MA which would be useful for my career … I have now been offered an exciting 12 month position with a commercial conservation company in New York. I chose West Dean as it has such a good reputation in the industry. I like having so much access to the workshops and working on quality objects as well as the small class sizes. The College is very well focussed on conservation in an intensive, positive and friendly way."